Brompton Bicycles recently announced that they are going to produce a limited number of “Black Edition” bicycles. Black Edition Brompton Bikes will feature all-black componentry, making them appear much more modern than classic Bromptons, whose design hasn’t changed much aesthetically since the 1970’s. 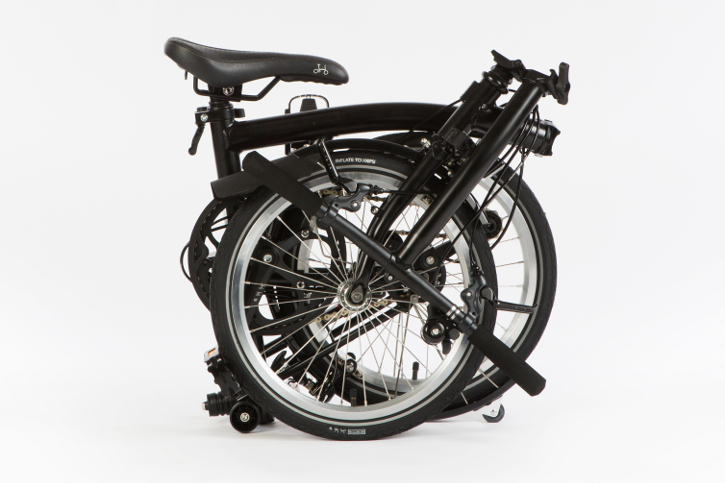 One thing that Black Edition Bromptons will have in common with regular Bromptons is Brompton’s superior folding design, which produces the most compact and effortless fold of any folding bike available. At Bicycle Roots, we will be stocking Black Edition Brompton bikes with 6-Speeds, M-type or S-type handlebars, and a Black main frame. While we could have chosen a more contrast-y main frame color, we chose to stock the Black main frame color only, because we know that New Yorkers like their bikes dark and mysterious. We’re calling this design the Bicycle Roots None More Black Brompton. This bike is so black, it bends space and time. Black Edition Bromptons are currently in production and we expect them to reach our store in late April. Supplies are limited, and when they’re gone, they’re gone. To get your hands on one of these limited edition bikes, we recommend that you Contact Us to place a preorder. Bicycle Roots is a Brompton dealer located in the heart of Brooklyn! We sell Brompton bikes, parts, and accessories, and our Service Department performs all types of repairs on Brompton folding bikes. Shop for Brompton parts and accessories at our online store, or come into our shop to demo a Brompton bike for yourself.